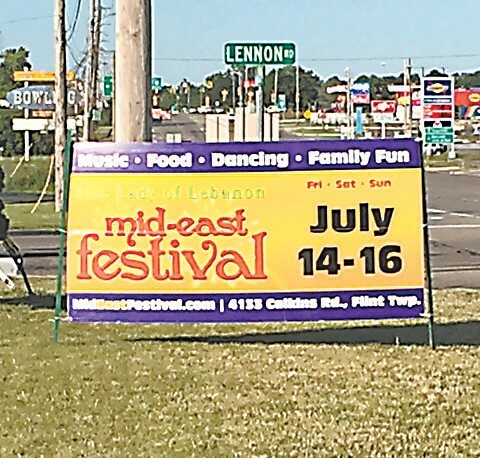 Signs are up all over town announcing the annual Our Lady of Lebanon Mideast Festival, from Friday, July 14 through Sunday, July 16. A Fireworks Show at dusk, one of the highlights each year, will take place on Friday and Saturday night, according to the festival schedule posted online at www.mideastfestival.com. 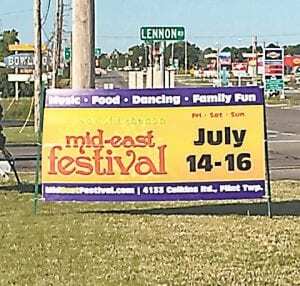 Festival hours are Friday: 11:30AM – midnight; Saturday: noon – midnight and Sunday: noon – 6 p.m. Entertainment will include a live band, music and belly dance performances. There will be a silent auction, raffle, belly dance lessons and church tours. Children’s activities will include bounce houses, Clown Face painting, an Obstacle Course Challenge, Train, Cannon, Mechanical Bull and Walk on Water. The food tent will offer traditional Mideastern dishes including Falafel, Rice & Yakhni. Beef Shawarma and Beef & Lamb Kabobs. A variety of desserts will also be available. Al events are held on the church grounds at 4133 Calkins Road.